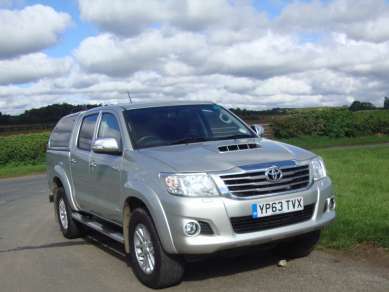 JANUARY 2014 63 REG TOYOTA HILUX 3.0 D4D INVINSIBLE 4X4 DOUBLE CAB PICKUP SILVER 1 OWNER, 47,850 MILES, MANUAL, R.C.L, E/W, Electric folding Mirrors, CLIMATE CONTROL, RADIO/CD with touchscreen bluetooth, SAT NAV, CLOTH SEATS ALLOY WHEELS with Cooper Discoverer 265/65R17 tyres, FRONT FOG LAMPS, SIDE STEPS, TOWBAR WITH TWIN ELECTRICS, UNDERRAIL LOAD LINER, TRUCKMAN COLOUR CODED CANOPY. SERVICE HISTORY. MOT 9th JANUARY 2019.